After our week long trip to Lake Grada in the discovery of authentic traditional Italian food and wine we found a perfect Ragu. Well we actually discovered two ragu recipes, one was an authentic Italian ragu recipe. The other was, horrible to be polite. The horrible one we had was in Venice, the city of romance and discovery. Unfortunately the food in Venice was expensive and of very poor quality. Made for the masses and to extract the tourists money. 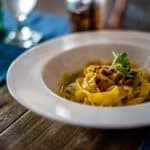 The authentic ragu recipe we discovered in Colombare. It was an unassuming place but at the top as far as trip advisor was concurred. The prices were very reasonable but all did not go well. The upside though was the ragu that we had. 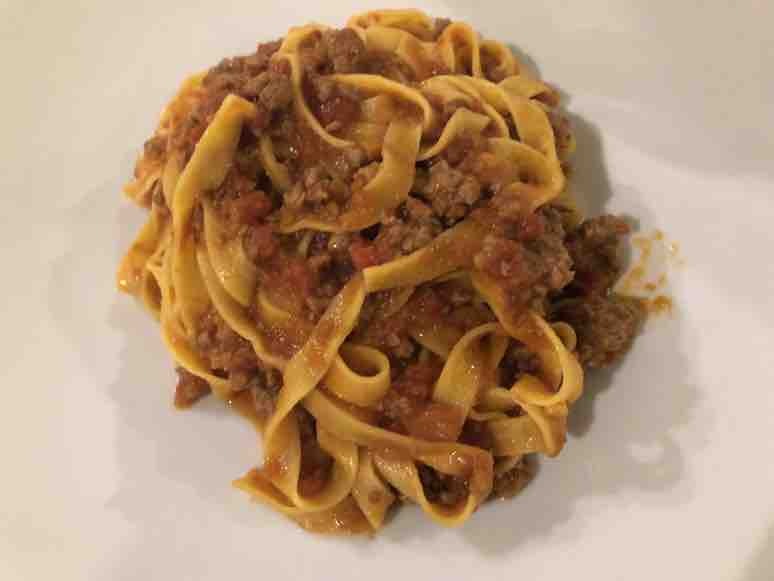 Our own ragu sauce, meat sauce, or bolognese sauce is very nice but the better half enjoyed this one as it was much lighter. In our ragu I use tomatoes and a lot of red wine with makes it very rich. Add the mirepoix to the pan with a little oil and butter, season well Sweat for around 10 minutes until the veg starts to become translucent. Do not burn them Add the minced meat and season, cook until all the meat is browned. around 15 minutes depending on how high the heat is. At this point you need to taste the mixture, and more seasoning if necessary. Now add your tin of tomatoes, glass of whiter wine along with the chicken stock. So we asked the owner what was in his recipe for the authentic ragu. Laugh, my belly hurt so much because between the four of us we can’t string a single Italian sentence. As he explained a lot of head nodding and knowing looks came from our table. My finger nails were nearly to the bone griping the table leg trying not to giggle as this passionate Italian restaurant owner was explaining how he made this lovely dish. Yes he took the time because he messed up a pizza order for us and we had to wait an age for our second course. Well we got a few words of explanation but the rest was guess work so I had to do some experimentation to get the sauce lighter. We did understand the white wine as we had ordered and drank plenty of that anyway. In the end I came up with a traditional mix of pork and beef mince. I used only one jar of tomatoes and the rest was chicken stock. I made my regular size batch of ragu that would feed an army. The upside is that there was a lot leftover to leave in the fridge and freezer making it the perfect cheap dinner idea. I had several portions during the week for a quick lunch, I mean quick as it took me five minutes to warm up in the frying pan in between doing my freelance SEO work. 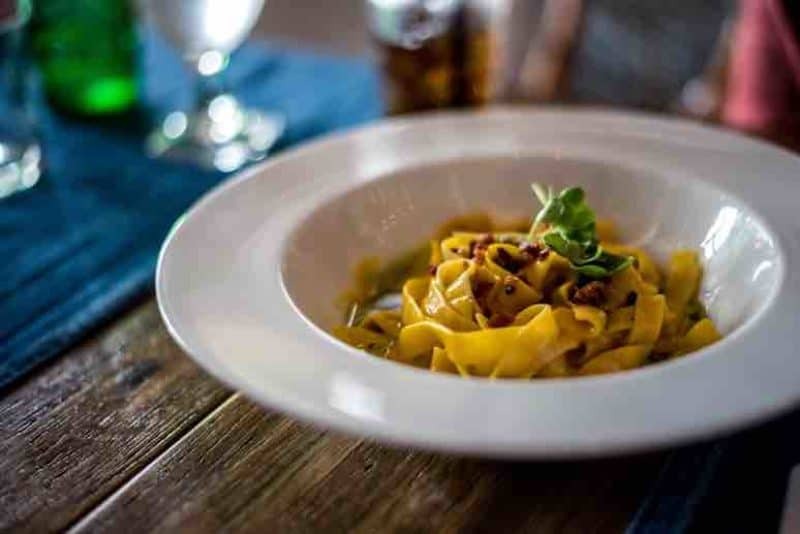 Traditional and authentically the pasta used in ragu is a Tagliatelle, nothing else, never ever as it just would not be the real deal. 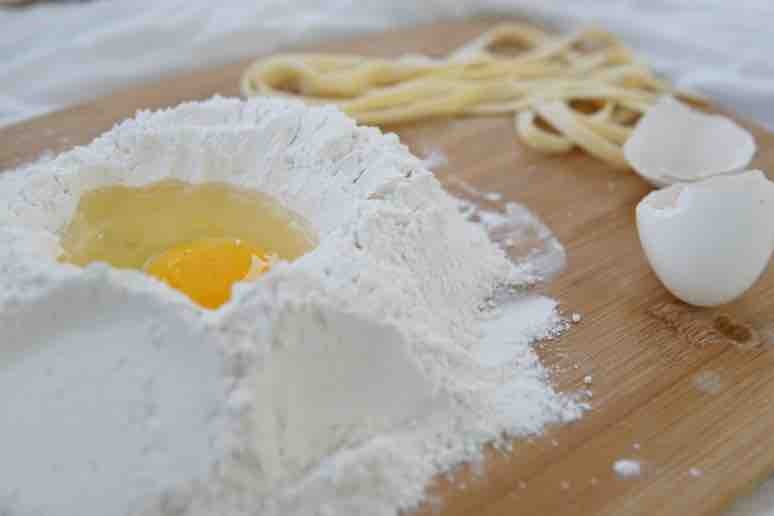 You can either make your own tagliatelle fresh pasta or use a good quality dried past. There is a slight difference in the two but with the great taste of this authentic ragu sauce you will hardy notice the difference. If you do want to make your own this great pasta making machine will speed up the process. Originally this dish was only for the wealthy Italians as it contained meat. Pasta was also expensive so if the poor were very lucky they would have some pasta with a meat sauce. Their meat sauce would contain no meat at all only the flavour from the meat that was cooked in the sauce. The meat was taken out and severed to the rich, it could often contain duck, goose, lamb, mutton and veal. Today it is rare that we find such a rich diverse variety of meats in our ragu. The first stage is where it differs from my bolognese ragu with the kids love. Originally the better half made the sauce and it only contained onions and the meat along with the tomatoes, wine, herbs and sugar. The kids didn’t like much vegetables so we kept the recipe the same. However the authentic Italian ragu requires a Mirepoix a classic start to any dish. A Mirepoix is just onions, carrot and celery sweated down in oil and butter to create base flavours. The important thing to remember when creating a classic mirepoix is to use equal amounts of celery, carrot and onion to create balance. .The real secret is to ensure a slow long cook of all the ingredients to ensure a transfer of all the flavours. The long cook also makes the meat tender and light for the Ragù alla Bolognese. Season each time you add more to the pot to ensure everything is well seasoned. Its a great lighter Ragu than my rich red wine bolognese.